Kuniskis also watered-down any possibility of high-performance versions of the Wrangler and Gladiator, potentially powered by the company’s fire-breathing Hellcat supercharged V8. “Everybody always asks me that question: it fits. You know that. It fits like a glove,” he said. “But the problem is that it fits like a glove and there is no air space around the engine and the whole external space of the vehicle so you have no crush space; you have nothing that can be used to absorb energy in a crash. 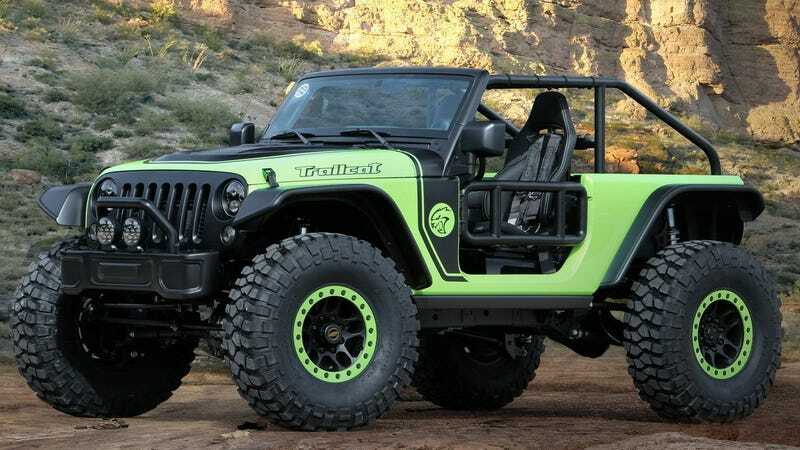 Personally, I think anybody willing to hop into a Wrangler with 707 horsepower has already signed their death warrant, and any concern for crash testing should go out the open canvas top. Kuniskis also mentioned nobody should be holding their breath for a two-door version of the new Gladiator pickup anytime soon, despite the recent reveal of the Jeep J6 concept at this year’s Easter Jeep Safari. He said the company would gauge interest but the current market volume for two-door mid-size pickups just wouldn’t justify a production run. Sorry to be the bearer of back-to-back bad news. If you are really hankering for a dangerous supercharged Wrangler cat, though, you could probably find a customs shop that would gladly accept your signature on a check. Dakota Customs advertises that they’re up to the task.